Oops - we don't appear to have a video for the ScanJet N9120. Capture single or two-sided documents up to A3-size with this fast, robust departmental scanner. Scan at up to 100 ipm1 with 200 page ADF and ultrasonic double-feed detection. Use HP Smart Document Scan Software or integrate into existing systems. 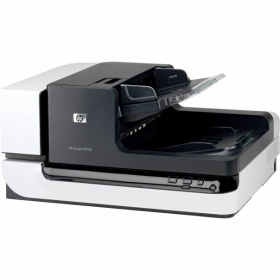 Get high-productivity document scanning at up to 50 ppm/100 ipm2 – in black-and-white or colour. Scan up to 50 ppm/100 ipm1 in black-and-white, greyscale or colour using the 200-page ADF with duplexer. Get accurate image with Kofax® VRS® Pro. Create scan profiles with HP Smart Document Scan Software. ISIS®, TWAIN and WIA drivers included. Handle a wide range of document types and sizes from A6 to A3. Capture materials from cheques and questionnaires to A3-size documents – hardware deskew straightens papers as they pass through the ADF. Use the A3 flatbed to scan bound documents, stapled reports and irregular or worn materials. Get HP reliability backed up by a full one-year warranty with on-site repair. Get HP reliability backed up by a full one-year warranty – including on-site repair – with the option to extend to three-year coverage. Depend on a scanner with a 5000-page daily duty cycle. Energy Star-qualified.